Lines from Linderhof: Coffee Anyone? The coffee service is an important part of any dinner party or luncheon. I often set it up on the sideboard -- a sterling coffee pot, sugar and creamer. A "scoop" of demitasse spoons -- some English, some American, some plate, some sterling and three precious Russian ones -- prerevolution. 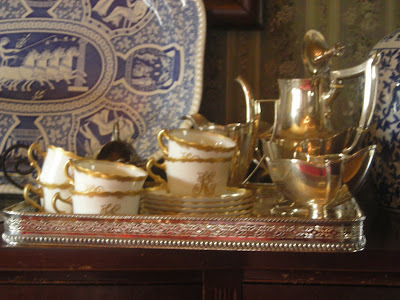 The other parts of the silver service -- the tea pot, the spirit pot and the covered sugar bowl are put away. The cups are old, heritage unknown, bought at a garage sale in the city ages ago. I collect white china with gold rims. The cups are dainty almost eggshell thin. Each cup has the same set of initials on it in gold. Coffee, it seems always tastes better when poured from a silver pot! 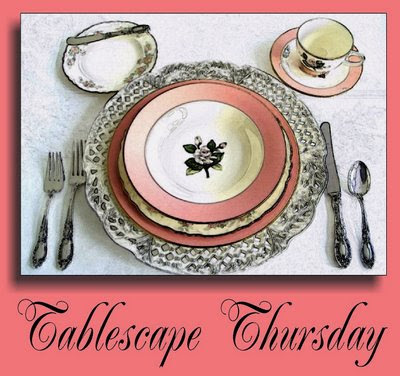 Thanks again to Susan, from Between Naps on the Porch, for sponsoring Tabletop Thursday. ....love your teacups, that was some good find at a garage sale! I also have some demitasse spoons from Russia, my grandmother brought them with her form the old country when she came here. I also have some old silver spoons from the Turkish side of my husband that were his great/grandmothers spoons. Thanks for sharing everything looks so nice and pretty. Wow, what a find!!! Those coffee cups take my breath away. I love the monogram and the white and gold coloring! BEAUTIFUL! Oooo yummy cups and saucers. Also love that platter behind them, wow! 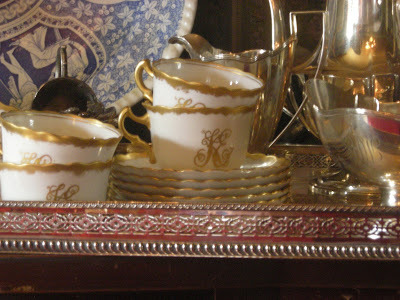 What beautiful monogramed cups and saucers! I would feel so special drinking tea from these. A very pretty display! BEAUTIFUL coffee service! You only have to ask me once... cafe creme please! Wowsa! I just love this. The tea cups are to die for (not seriously, but close). I just love silver coffee and tea sets. I have a nice set I got at a thrift store & I don't even drink coffee or tea. But I love how beautiful they look. Your setup is fabulous. Your posts always cause me to sit back, dream, picture your pretty setting and indulge myself. Love,love that you collect white china with gold rims. It is SO the prettiest! I get great pleasure living here in the Blue Ridge Mountains imagining your home in Kansas. I don't know Kansas but you have brought it nearer. I love those fancy teacups and saucers. So grand and opulent! Your pics made me resolve to finish my wedding china to my original 12 place settings before my 20th wedding anniversary. LOVE those beautiful cups and saucers and what a "find". Great post Martha and your pics are just beautiful. BTW, I never mentioned that your new chandelier is GORGEOUS!!!!! What a fabulous "find". I love those cups and saucer..just beautiful!